I joined Corinne’s Surf Tour this weekend in Newquay at Towan Beach, after interviewing Corinne about the girls only tour and all things surf I was really excited to take part. The day started with a yoga session, great for stretching and preparing the mind and body for catching some waves. The POW Energy Water and Hemp Bar from Myprotein on each mat was a very nice touch, perfect for fuelling up and getting ready for surfing. After yoga it was time to pull on our wetsuits and head for the waves, partnering up to carry boards down to Great Western Beach I got chatting to some of the other girls, we all instantly clicked and had a lot in common, I knew it was going to be a great day. My aims for the session were to feel confident in the water again, having had a year and a half off from surfing and a baby four months ago I was feeling a little nervous about getting back on a board and seriously doubted my fitness level! Once on the beach we were split into two groups, one for beginners and the other for girls who could already surf. After a quick recap I put my nerves aside as I paddled out and caught my first wave. I was pleasantly surprised at how quickly it all came back to me. Depending on how well I got on I hoped to be out back on the green waves, and I was. Although small the waves were fun and perfect for building up my confidence. In between the swell it was so nice to chat to the other girls, we all gave each other encouragement and celebrated together when we caught waves! A bit of whooping and cheering goes a long way in the water and helping each other along was a great confidence booster. After a good first session it was time to refuel with some lunch and a tasty smoothie. In the afternoon I had some coaching from Corinne on turning right, something I don’t do that often, as I love a lefty! It felt good to mix up turning on the waves and something I will keep practising. Eventually, we all began to get aching arms from paddling and not wanting the day to end I caught my last wave to the shore. The day was rounded up with a prize giving and Corinne gave each of us a lovely goodie bag full of treats fit for any budding surf girl! Checkered Photography captured the action on camera; Sarah was in the water with us all day getting some awesome shots of everyone shredding and having fun. I also met surf blogger Kirsty, I’ve been a fan of her blog Kernow Surfgirl for a long time so it was brilliant to finally meet her and chat about all things surf! Surf instructor Betsy was also in the water coaching us along with Corinne, they were both so encouraging and made the experience an awesome one. The day was fantastic and really boosted my confidence plus I meet some lovely ladies who I’m hoping to keep in contact with and surf with again. You don’t have to have your own gear to take part, but if you do have a wetsuit and surfboard you can take them along. 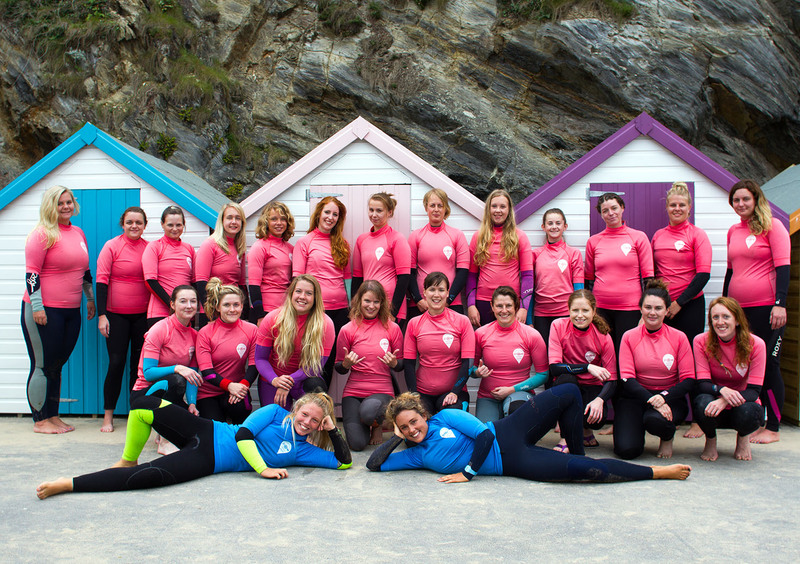 If you want to learn to learn to surf or improve your surfing and meet like-minded ladies then sign up for Corinne’s Surf Tour, you won’t be disappointed! The next surf days are at Saunton Beach in Devon on 17th September and Anglesey, North Wales on 24th September. It is funny how interconnected the blogging world is! I saw your story and was eager to read it. I looked at the picture and scanned the faces. Yup! There is Nicola! Next to…Wait! is that Kirsty!?! Pretty cool you all got to hang out. And surf again too! It must have felt great to return to the sea again. Thanks! It was such a fantastic day and awesome to be back in the water! I’ve followed Kirsty’s blog for a while so it was great to meet her, it is such a small world!